As technology evolves, more and more electronic systems are becoming integrated with other equipment and systems. More commonly this is achieved via Internet Protocol (IP), allowing for interconnectivity over Local Area Networks (LANs), Wide Area Networks (WANs), Virtual Private Networks (VPNs) and the Internet. Comtel Technologies are able to offer a variety of IP-based communication solutions that allow greater flexibility and, in commercial applications (e.g. Hospitals, Healthcare Facilities, Aged Care Facilities, Airports, Schools, etc), integration with other ‘mission-critical’ systems, like Access Control and CCTV. Some of our system solutions are listed below, but please contact the Sales Team at Comtel Technologies to discuss your requirement. The Aiphone IS series is an exchange-based intercom system that can make centralised security management simple and easy. Ideal for both small and large facilities. 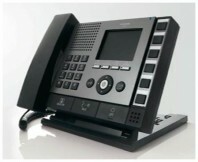 The system also features network-based IP intercom stations for connection over LAN / WAN / VPN. The Aiphone IX series enables communication between an infinite number of door stations and master stations with no distance limitations. Using an existing IP infrastructure, the IX system can be integrated with VMS (Video Management Software), Access Control Systems and IP-based CCTV systems.